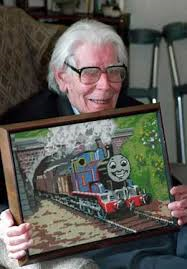 Today, 17 years ago, the Reverend Awdry passed away and people who have read his books, the Railway Series, will know how he inspired children to get into railways, and my story is no exception. 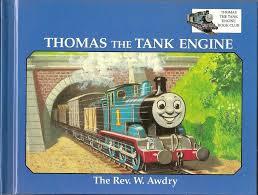 As I mentioned in a previous post, I still have all of the books in my attic and my passion for railways as a whole is because of him. Here is your friend Thomas, the Tank Engine.He wanted to come out of his station-yard and see the world.These stories tell you how he did it.I hope you will like them because you helped me to make them. 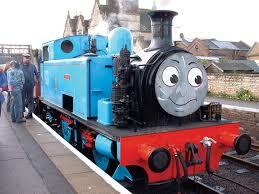 In 1979 Britt Allcroft met with Awdry at the Bluebell Railway, in Sussex, where Stepney the Bluebell Engine, is located. She had been producing a documentary, and had read his books, saying that she fell in love with the storytelling and his enthusiasm. She told him about her plans to use models to tell the story of Thomas and his friends. He was reluctant at first, due to the BBC having a failed adaption in the 1950s, but once the product was being produced, he knew that this would be as faithful to the stories that he had created. David Mitton directed the episodes, with Mike O’Donnell and Junior Campbell on the music and everything started to fit into place. A narrator was sourced, Ringo Starr and he shortly became the voice of the storyteller. The two became friends, and right up until Awdry’s death, they kept in contact with each other. Starr voiced the original two series, and the programme became an instant hit with the public, due to simplicity of the stories, and magic that the models conveyed. Apart from writing, he volunteered at the Talyllyn Railway in its second year in operation as a guard, and eventually wrote this into his books, becoming the Skarloey Railway. He had a model railway, and exhibited it across the country. He received a OBE in the 1996 New Years Honours list, but was too ill to travel to London. He died peacefully in Stroud, Gloucestershire, on 21 March 1997, at the age of 85. This is where my story comes into place, as I have fond memories of watching the first television series, and still do to this day, due to how it has affected my interest in railways. After this, I visited the heritage railways across the country, getting my chance to visit the little blue tank engine in person, although the original, and my favourite will always be the Thomas at the Nene Valley Railway, which was named by Awdry in 1971. I bought the wooden models when I was young, and had a large expansive layout on the dining room table, with my great grandmother’s table being used for all eating arrangements. Thanks Mum and Dad! Eventually, this was transformed into electric trains, with Hornby’s models coming into full front, and this took off, so much that an extension had to be added on the front of my house. Again, massive thanks for my Mum and Dad for putting up with my hobby, although, I can say that they are both enthusiasts now. With this, I started to get into the history of the railways, from their Victorian past, right up to the modern diesel and electric locomotives. I think it is safe to say now that I am a Railway Enthusiast and Historian, and while I am still studying history at University, any reason to link it to the railways, is a perfect excuse. But, what has struck me more than anything is how this series of books, which was developed into a television series is still going strong. Whatever your thoughts on the programme now, and its quality, which is up to you, as I never looked past series 4, when all of the stories was adapted. Series 5 and beyond were new adventures that were not written by Awdry. Children of all ages are inspired to visit the heritage railways across the country because of the mis-adventures of Thomas and his friends. 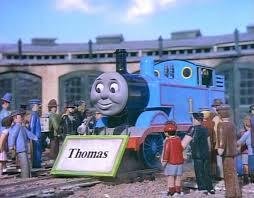 Now this has become a global phenomenon, and back in 1943 when the stories were first being told, I don’t think he ever expected it to have such an impact on the potential future railway enthusiasts. 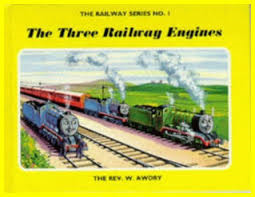 On behalf of all Loco Yard readers on this day, I would like to thank the Rev Awdry for all of the memories, the fun, and the nostalgia that we still experience today, when we open the book covers or put in the old VHS tapes. I would be a different kind of guy, and I would not be writing for this blog if that was not the case. So thank you, for everything. 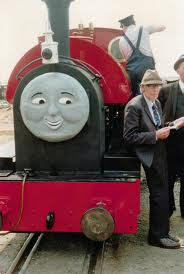 Rest in Peace, Reverend Wilbert Vere Awdry OBE. 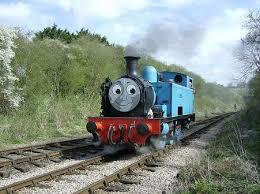 Model of the Week – Thomas the Tank Engine! ← UK Heritage Hub! Issue 36 now ready to download! Great story ! I too grew up reading these exact same books. I recall when I was about 4 years of age, going down to the local library and exchanging The Revs books, week in, weeK out ! These were the only books I read and the fascination for railways was instantly born.